Bismillahirrahmanirrahiim. 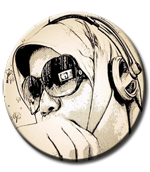 Assalamu’alaikum w.w. Supriseee... right now i’m trying to write my blog in English. Why? Hmm.. My English is so so, please correct me if i'm wrong. But, I’m trying to write a global content. Actually on Saturday, March 16th, 2019 I joined blogger gathering from Blogger Perempuan Network and ProPS Indonesia. The issue that we talked about “how to make SEO friendly blog and how to earn money from your blog”. Do you want to know the detail? So you must read it. A cloudy morning and a cool breeze made me reluctant to leave the house. It felt like I just wanted to pull the blanket up and down on the bed. But the blogger gathering issue was too good to ignore. For some people, it seems difficult to leave home to get a job, but they still need money for their daily needs. Like me, so being a blogger is the job that i choose. I just write the best world issue that people will search it then money will come to me. Is that easy? No, of course. There must be several term and conditions for it. Before starting to write, you should know what SEO is. In wikipedia, Search engine optimization (SEO) is the process of affecting the online visibility of a website or a web page in a web search engine's unpaid results—often referred to as "natural", "organic", or "earned" results. In general, the earlier (or higher ranked on the search results page), and more frequently a website appears in the search results list, the more visitors it will receive from the search engine's users; these visitors can then be converted into customers. People search an article on internet must be something that they want to know. They will be annoyed if the article they open does not contain the information they want. So that’s why a blogger must write the right article who have a thematic, informative, good chronology and a solution content. Mrs. Nunik Utami, speaker from Blogger Perempuan Network, say that if you want your article to be on the first page on google search, you must follow what topics are trending in global search. Title is the first words that people read for an article. If you write a wrong title, so people will ignore your article. The right title is a title that makes people corius about our article and make them read it. Such as “How to have a good couple in a world” or “3 romantics design for your bedroom”, etc. Like i write above, "write the right title". One of the condition for the right title is having a keyword. Google will check first your keyword on your title. That’s why on google search page the title is the main sentence that is displayed. After checking a title, Google will check keyword on your first paragraph. First paragraph contains sentences before you press ‘enter’ for a space to the next paragraf. If you just put “Hi, Guys!” then you press enter, it means words “Hi, Guys!” is your first paragraph. So be careful on it. After first paragraph, insert keyword in the middle of your article. Google will search your keyword after reading 500 – 1000 words (it depens on how long your article). For closing google will search keyword on your last paragraph. So don’t forget to insert it. So, in your blog, you describe for metatag as the same as title. Write that right description. Description that people will see your article. Don’t forget to insert keyword on it. It makes Google easly put your article on first page of Google search page. Backlinks are incoming links to your blog. When your blog links to any other page, it's called a backlink. In the past, backlinks were the major metric for the ranking of a blog. A page with a lot backlinks tended to rank higher on all major search engines, including Google. so create an article that make people enjoy put your blog link on their blog. Like i wrote before, you can earn money from your blog. How? There’re 2 ways to earn money from your blog. For Bloggers who have personal branding, they can used their blog to approche a Branded product. A company will pay them to write brand's product. In Indonesia (especially big cities), a company is better off using advertisements from Blogger than using electronic media (TV and radio). I've ever asked my friend who work as a marketing manager, she says that ads from bloggers are more relevant to the public than through electronic media or print media. Unfortunately blogs with personal branding cannot reach remote villages. For bloggers who live in small cities, that doesn't mean they can't earn money from their blogs. Google provides an opportunity for bloggers who live in small cities to use google ads. Based on Wikipedia Google Ads online advertising platform developed by Google, where advertisers pay to display brief advertisements, service offerings, product listings, video content, and generate mobile application installs within the Google ad network to web users. 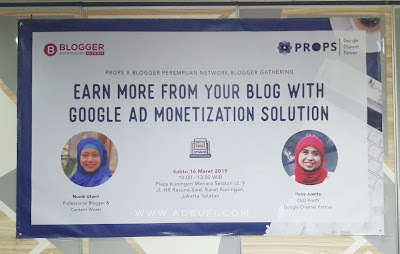 Mrs. Ilona, ​​speaker from ProPS Indonesia, said that everyone in the world can put Google ads on our blog, as long as it is available for the internet. Google will pay us from the number of clicks per ad is posted on our blog. There will be different payments for one ad click in each country. If you want to get a higher payment, Mrs. Ilona advised us to write articles on blogs using Arabic. All instructions and blog templates use Arabic. So, Google will read our blog from Arab countries, even we are from Indonesia. Do you want to know, how much google will pay us if we use Arabic? But, if you have 20 million viewer per a month, you can sign up to Google Ads Manager. if google adsense is paid per click, then google ads manager is paid per impression. Wow.. ProPS is Google Channel Partner for Publishers. We are committed in uplifting publisher’s revenue through Google’s Monetisation Solution. Great website deliver its best to their users first. We aim to get the most out of our publisher’s partner in order for them to exceed the revenue potential. ProPS was found in 2016 by two digital enthusiast, Edi Taslim and Ilona Juwita, with more than 15+ years of experience in Publishing Industry. We know our playing field especially related to Google Publishing Products (AdSense, Ad Manager : Ad Exchange, Ad Manager : DFP Small Business/Premium, Google Analytic 360, Google Policy). 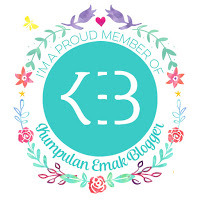 Blogger Perempuan Network is a network site for women-only bloggers founded in early 2015. 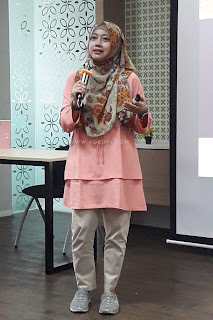 Blogger Perempuan are the fruit of ideas from 3 women with their respective expertise in the online world. All 3 women are united by 3 equations namely "women", fall in love with the online world, and have the desire to advance the position of Indonesian Female Bloggers. 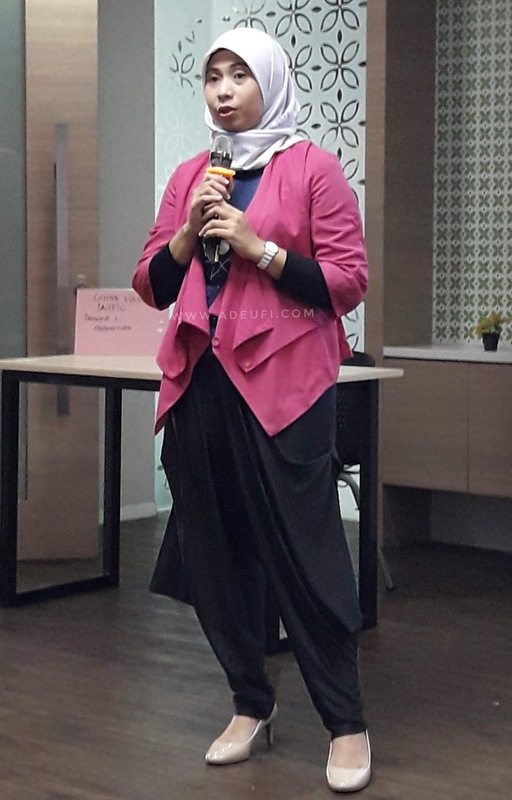 At present the number of Blogger Perempuan Network members reaches 3400+ spread across various regions in Indonesia. 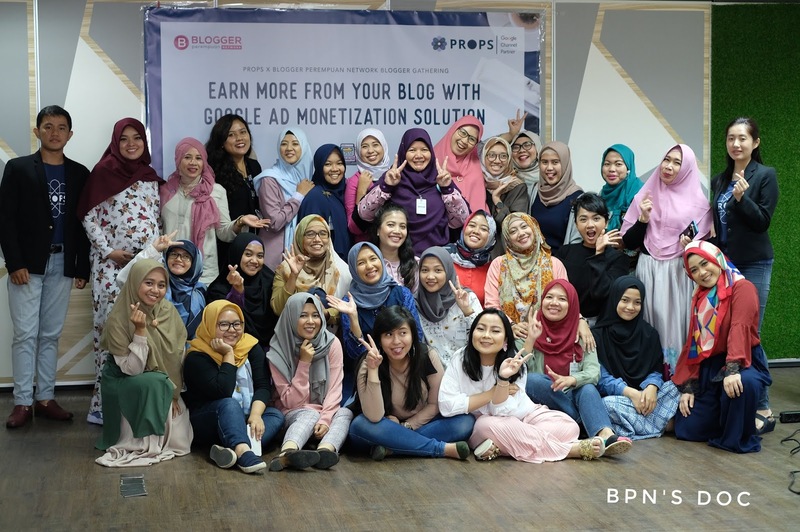 Blogger Perempuan often hold beautiful chat which is an event to strengthen the friendship between members and share knowledge related to blogs and social media. Not only knowledge that I got, at the end of the event we were given a free salad from Endus TV. yeeey .. my stomach-filled, so do my brain. Ok, guys.. wanna earn money from your blog? Do what i wrote above. 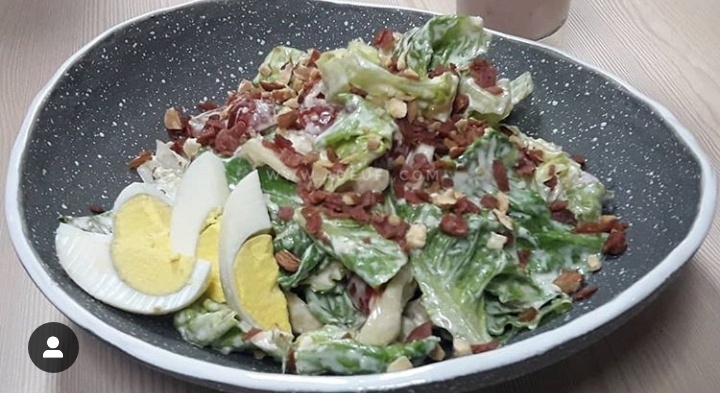 Good content with a smart SEO, of course these are best connecting to earn money from our blog. 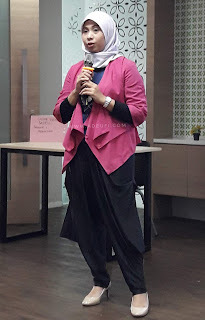 Sebagai blogger yang masih terus belajar, ini bagus sekali apalagi sekarang lagi belajar banget untuk SEO soalnya biasanya aku menulis hanya untuk sekedar sharing. Tapi jadi senang sekarang nulisnya selain berbagi juga dibayar. pengen belajar, kemaren sih daftar tapi ketinggalan. banyak ilmu yang di dapat dari workshop ini, pinter deh kakan bahasa inggrisnya.